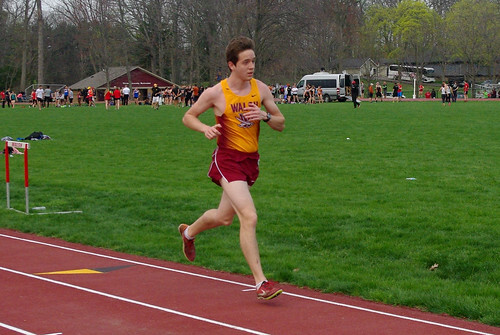 Surprisingly, Noah's Catholic College hosted a track meet on Holy Saturday. I dunno - maybe they figured it's the best form of penance after Good Friday. Noah ran the 5K. He did okay. Didn't PR, but held close to his usual times. 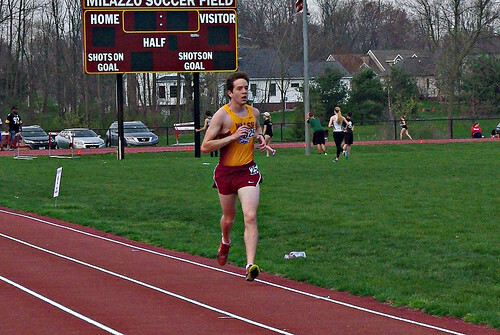 He is like most cross country runners- he puts up with track season to keep in shape for cross country training! 2. My sister decided that we should bring back the Easter Bonnet this year. 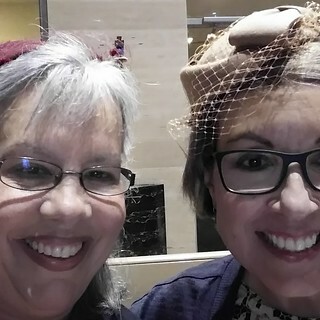 So she ordered these hats for us and we wore them to the Easter Vigil. Father V. made a big point out of complimenting each of us on our head ware, so I think they were a hit with him. My girls thought I looked pretty. Mr. Pete smirked. Sis tells me that we will have to make this our new Easter Tradition. We'll see. 3. 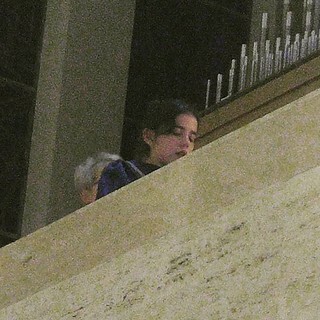 This is a picture I was able to get of Rosie singing in the Hallelujah Chorus with the choir at the end of the vigil. She is the youngest choir member. The choir did a great job as usual. The next day Mr. Pete cantored for the 11 a.m. mass. I don't have a picture or video of that but I thought he was in exceptionally good voice and he was excited to sing for Easter Sunday. I was proud of him. 4. My Aunt Dot turned 96 on Good Friday. 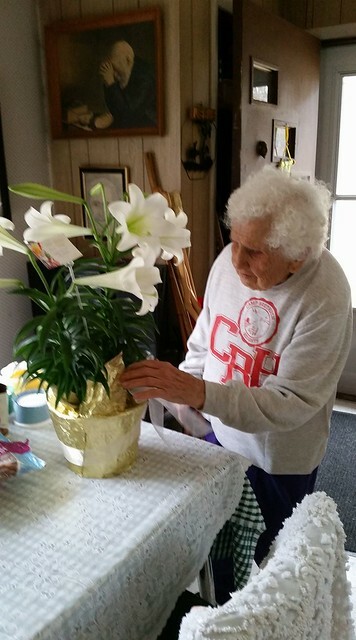 I called a florist near her home and ordered an Easter Lilly for her birthday and Easter. My cousin was kind enough to post this picture of it on Facebook. I see five blooms on it with a few more ready to open up so I think I definitely ordered from the right place! I figured how often do you get your birthday on the Triduum!? So special flowers for a special lady. 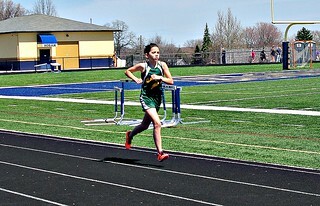 My little runner is grounded for the rest of track season. She has peroneal tendinitis in both ankles and has to rest for the next five weeks. She can do some cross training (she's been riding her bike) and I plan to have her do some upper body exercise tapes. But she is done with track for now. I can hear the rest of your track parents out there saying "LUCKY!!!" Track meets are long and tedious. Middle school track meets eat up every Sunday afternoon. So I will say that there is a part of me doing a happy dance that I have my Sundays back!! I also have my late afternoons back too because if she can't run, I don't have to drive her to practice. Another winning situation for ME. But it's okay for Rosie too. She's a 6th grader competing with 7th and 8th graders. If she's going to nurse an injury, this is the year to do it. The main thing is to stay in cardiovascular fitness, rehab her injury and make her ankles strong to prepare for cross country training this summer - which really is where her heart lies. A little side note, the doctor noted that she also has a bunion forming on her big toe. Bunions are usually formed by older ladies from wearing high heels and pointy shoes. But my little girl has free-range toes. She's either barefoot or wearing trainers with plenty of toe room all the time, so her bunion was a surprise to all of us. I had to get her a spacer to keep that toe growing straight. As a mom, this is a first for me! Divine Mercy Sunday is Sunday. I've been posting and praying the novena leading up to it all week. It's awesome to contemplate God's merciful love. But giving and receiving mercy can be challenging. A few days ago as I was checking out my diocesan web site, I came upon something that simply stunned me. A mix of emotions followed including fear, anger and resentment, but mostly pain and hurt. It seems that a venue in the diocese has invited a certain guest speaker I have a history with. This particular speaker held an English class that I enrolled two of my children in about 11 years ago. 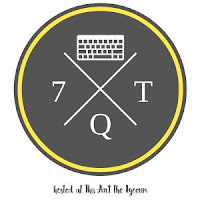 It was not a good experience. In fact it was a fiasco. We became the only family in the class to be kicked out of the program. Before we enrolled I spoke to this teacher and was given assurances that a struggling student wouldn't be a problem in this class. But instead of this being a positive classroom experience, it was a humiliating failure. I was mortified. The memory of all of that came flooding back when I saw the announcement about this speaker on the web site. I guess I was just thunderstruck. So I did something I often do when I'm upset and need a shoulder to cry on and an ear to listen - I called my sister. And as she usually does, Sis played the Devil's advocate and made me think about things in a different way: This teacher and I are both older, and wiser. We have both experienced more highs and lows in life since that class all those years ago. Maybe we have both been humbled. Maybe I could find it in me to cut some slack - all very sage advice. This week has been all about seeing God's mercy for different groups of people. So maybe I could be merciful and forgive the transgressions of a young person seeking to become an authoritative educator all those years ago. And while I'm at it, I could be merciful to myself too. 11 years ago I had six children and was struggling with high school teenagers and a new baby with other kids in between. I was postpartum and peri-menopausal, overstretched and under rested. It's possible my feelings were a bit on the raw side. So while I'm at it, I'm going to give myself a little mercy too. 7. It's not the whole crew - missing Calvin and and my lovely daughter-in-law Sarah. 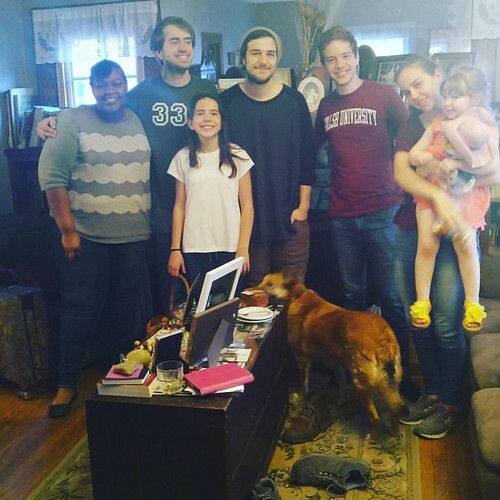 But this was a good turn out for Easter Sunday dinner!